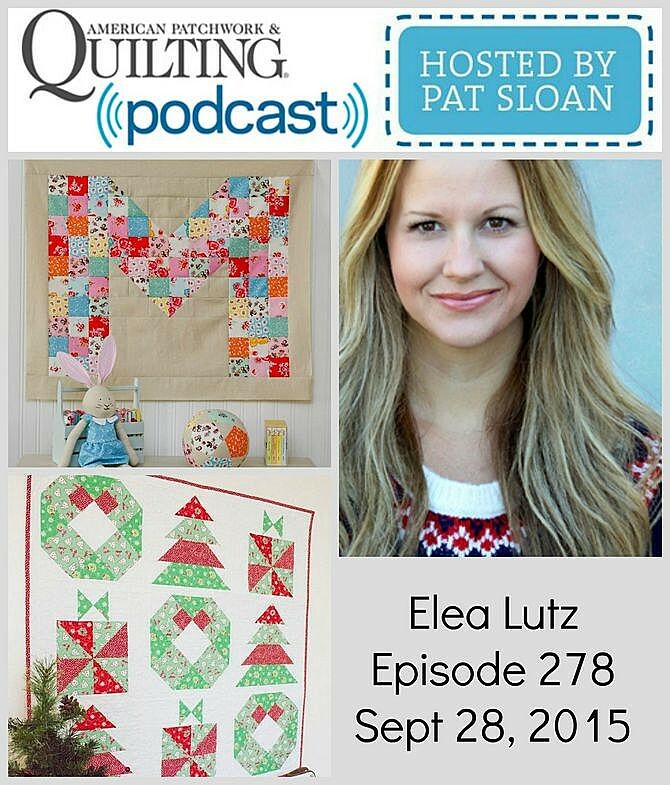 Pat Sloan: Fall Round up plus some adorable free pattern links! Round up time! I spotted some adorable fall things to share today! A bit of fabric, plus several free patterns you might want to try! Have you checked out the Aurifil Thread club? It's a great way to collect colors. So many of you have asked about the Ladybug sewing caddy, similar to the owl one that I got. The sewing caddy is HERE and check out the ring pincushion too .. squeal!!!! it's SO CUTE! so many of you want to know 'what do i make with....' here is a 'no waste' project using 1 layer cake, 1 charm pack, 2 3/4 yards neutral fabric. And it's FREE right here! A nice scrap busting leaf potholder, or I'd use it for a trivet! Heck I would use them as decorations.. sprinkle them across your coffee table, or put a group of them hanging from ribbon. What about a banner? Have you wanted to try out some decorative threads? This free mug rug is also incredibly adorable. Make a few of them for all your quilt buddies! Pat Sloan: Chatting wool, entering shows, designing and More! 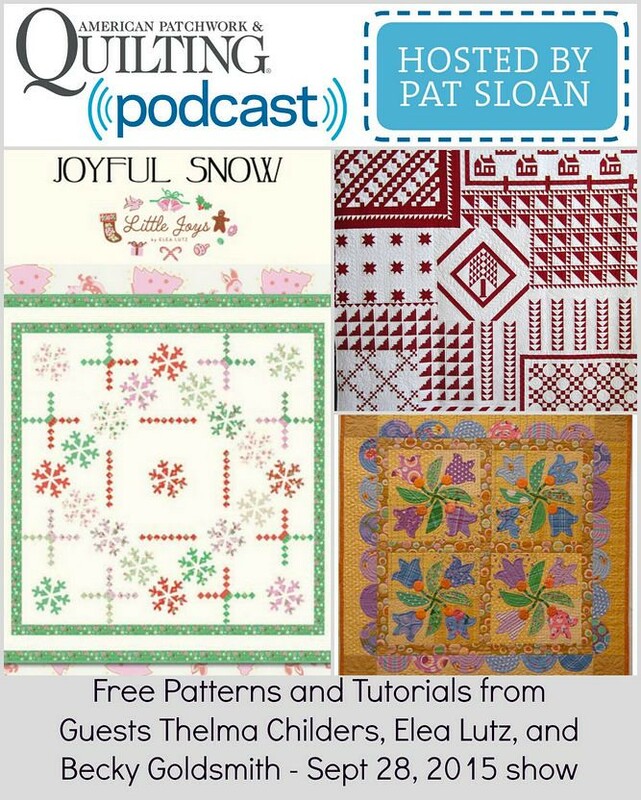 *** Free patterns & Tutorials from my guests Thelma Childers, Elea Lutz, and Becky Goldsmith at the end! 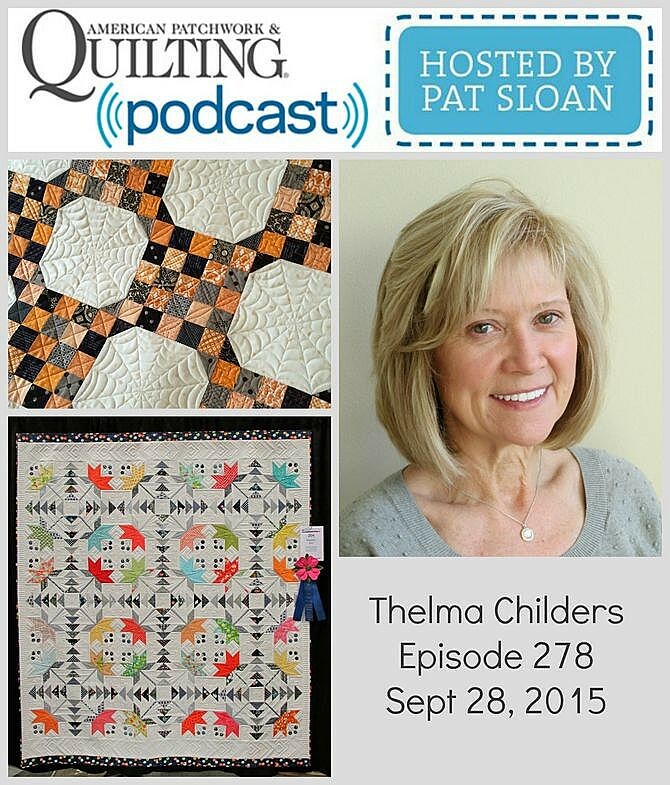 Thelma Childers is an amazing quilter who travels, makes award winning quilts, and cuddle up quilts. She writes about all of this at her inspiring website Cupcakes 'n Daisies. 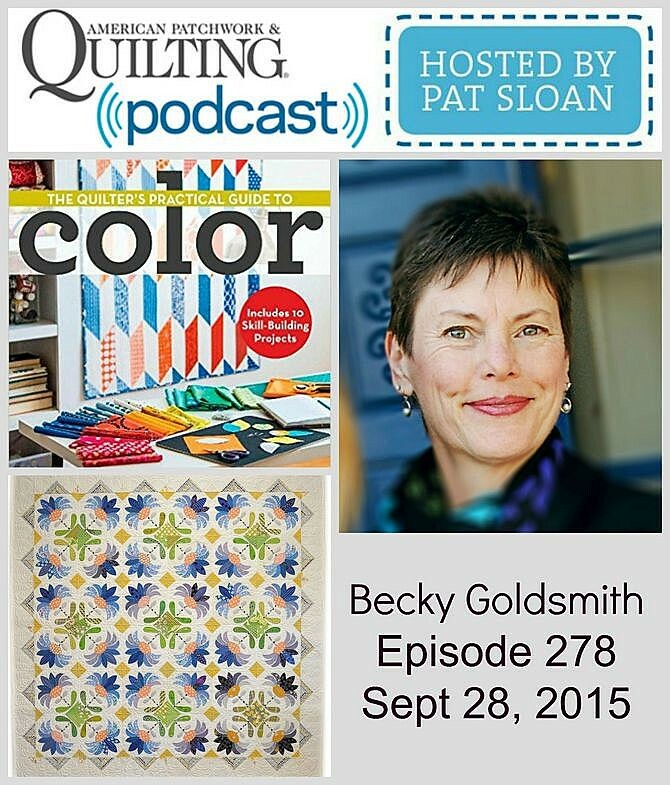 I wanted to hear about her lastest quilt Coastal Lily that is on the front of the 2016 AQS Caldendar, and hear a bit about her famous Red and White Tribute quilt. Elea Lutz is a print and product designer with a style that is sprinkled with sweet, colorful and playful illustrations. Her tag line says it all for me in her about page, 'Some of my art + joys'! 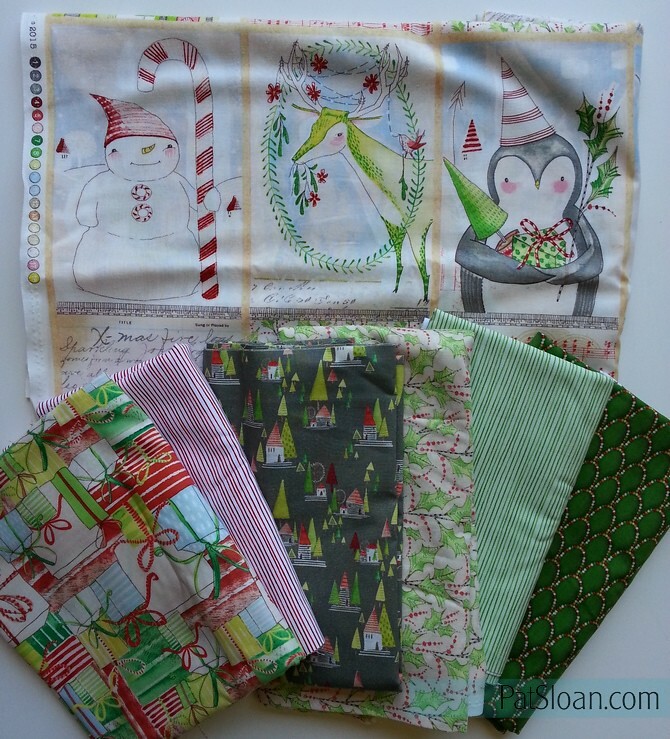 Many of us in the quilt world are discovering her fabric with Penny Rose, and I did her Christmas sew along with the Fat Quarter shop, remember that? I can't wait to hear about her designing! Becky Goldsmith is half of the Piece o' Cake design team, with Linda Jenkins. Becky is a amazing teacher, awesome quilt maker, and together Becky and Linda have designed hundreds of quilts in Books, block of the month and single patterns. Becky has also written a book on Color that is fantastic. We are doing to dive deep today into Color, wool applique and maybe I can persuade her to give us some hand applique tips for points! -- Becky has a lot of video tutorials and the tulips are a free pattern! -- Elea's Joyful Snow pattern is free HERE and Ornament! Pat Sloan: What are you saving it for? When I was teaching at Sewingly yours in North Carolina the other week I bought some fabric, because I'm a quilter, and I need it... but I digress! I might be hoarding it... um... saving it. Saving it for JUST the right project. Then I realized, I have a lot of fabrics 'Saved' for the right project. A few have been saved SO LONG that I may not actually.. ummm...mmmmm.. well.. I may not really care for them anymore. WHY am I saving this fabric for a perfect quilt? Why am I not sewing it up to ENJOY it before I may not like it as much anymore. We don't care for it anymore. I vowed to NOT do this anymore. I will make up SOMETHING ... something to enjoy it. There are LOADS of great designs that showcase fabric. We don't need to wait for the PERFECT layout (that by the way..NEVER seems to appear) to use it. Your turn.. what do you think of this? What do you think of actually SEWING up that precious pile of fabric instead of saving it for.. eternity?